Our large office at Armonk in New York State is our US headquarters, with more than 700 employees. At Climate Week NYC 2016, we announced our decision to build a solar power plant directly on our own premises to supply our office with renewable power. As a founding partner of the Climate Group’s RE100 initiative, we are committed to covering 100% of our power consumption from renewable sources by 2020. At the end of 2016, the share of our power generated by renewables was 84%, mostly purchased from reliable producers. 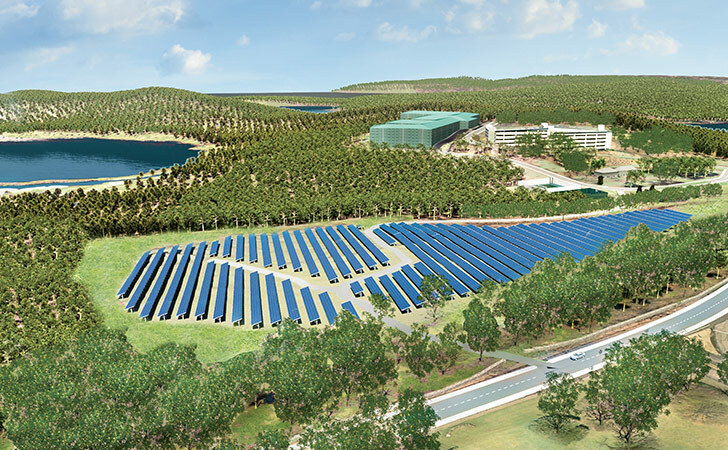 A rendering of the solar power plant we are constructing at our US headquarters in Armonk, New York State. The installation will supply more than 60% of the site’s power requirements. Going one step further, we have recently started to build our own solar power facilities. Following earlier projects in Italy, Switzerland and the UK, our new venture in Armonk is the largest launched yet. Comprising ten acres of ground-mounted panels, the facility will have a capacity of two megawatts, sufficient to supply more than 60% of the site’s power requirements. Photovoltaic installations not only have substantial environmental benefits, they are also becoming economically viable. With a capital investment of USD 7 million, we expect our solar power facility at Armonk to have a payback time of less than seven years. On top of that, it will also enable us to add battery storage in the future and make our operations more resilient in the event of a power outage.